Chart showing the proportions of underlying Akt substrate-like sequence motifs found in a PTMScan® study using Akt substrate motif mAb 2 and Orbitrap LC-MS analysis. Analysis of one experiment on peptides from H3255 cells gave 121 non-redundant sites containing Akt substrate-like motifs. The primary motifs are highlighted in white. The proportion containing phosphoserine was 72%, and the proportion with arginine residues at both the -5 and -3 positions was 65%. This antibody has a strong preference for arginine residues at the -5 and -3 positions, and to a lesser extent recognizes peptides with an arginine residue at just the -3 position. The Motif Logo shows the amino acid distributions around the sites recognized by the antibody. Cells are lysed in a urea-containing buffer, cellular proteins are digested by proteases, and the resulting peptides are purified by reversed-phase, solid-phase extraction. Peptides are then subjected to immunoaffinity purification using a PTMScan® Motif antibody conjugated to protein A agarose beads. Unbound peptides are removed through washing, and the captured PTM-containing peptides are eluted with dilute acid. Reversed-phase purification is performed on microtips to desalt and separate peptides from antibody prior to concentrating the enriched peptides for LC-MS/MS analysis. CST recommends the use of PTMScan® IAP Buffer #9993 included in the kit. A detailed protocol and Limited Use License allowing the use of the patented PTMScan® method is included with the kit. Antibody beads supplied in IAP buffer containing 50% glycerol. Store at -20°C. Do not aliquot the antibody. 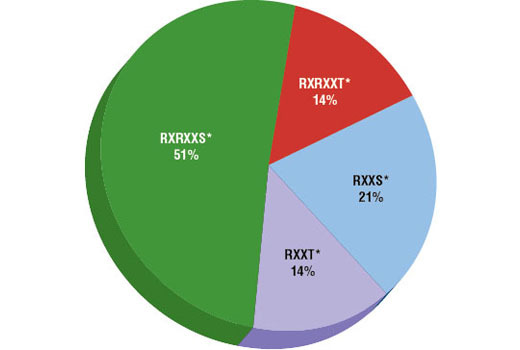 Group over 300 downstream substrates for AGC family kinases recognizing the RXRXXS/T motif were identified with PhosphoScan Technology using Phospho-Akt substrate antibodies. These CST™ antibodies are powerful tools for investigating the regulation of phosphorylation by Akt and other Arg-directed kinases, as well as for high throughput kinase drug discovery. In this assay, PTMScan® (RXRXXS*/T*) Motif Antibody bead conjugates are used to specifically enrich phosphopeptides containing the (RXRXXS*/T*) motif (S* = phospho-serine, T* = phospho-threonine). Moritz, A. et al. (2010) Sci Signal 3, ra64. Rush, J. et al. (2005) Nat Biotechnol 23, 94-101. Gnad, F. et al. (2016) Proteomics 16, 1992-7. AcetylScan is a trademark of Cell Signaling Technology, Inc.
MethylScan is a trademark of Cell Signaling Technology, Inc.
PTMScan is a trademark of Cell Signaling Technology, Inc.
UbiScan is a trademark of Cell Signaling Technology, Inc.
To learn more about our Proteomics Kits and Services, including pricing, please answer a few questions for our proteomics group.